Last October, Mel Kasold began having stomach pains. For months, the truck driver brushed it off as a stomach bug. Until his wife Maria implored him to see a doctor. "He's usually the type of guy who's like, 'I can pull it off,' but in January it got worse," said Maria Kasold, Mel's wife of eight years. In March, Maria and Mel got the news no one wants to hear: Mel was diagnosed with stage 2 Non-Hodgkin lymphoma. He began chemotherapy in May as the Vegas Golden Knights were making their playoff run. Mel said watching the team defy expectations helped him stay positive. "Every time I'm down, I always got fans and players to look up to," Mel said. "and just keep a positive attitude." As Mel began the fight of his life, Maria took to the Golden Knights Click Facebook group to share his story. The group has more than 20,000 members, many of whom post fan photos and updates often. Maria's post about Mel's health received hundreds of likes and comments. Soon after, the fan support went beyond the virtual world - fans offered up tickets to the couple and one fan, who's a cancer survivor herself, even offered to drive Mel to his chemo appointments, so Maria could continue to work. "I couldn't be doing it on my own," said Maria. "I'm very thankful for them." Mel recently underwent his last round of chemo, which he said was the toughest yet. An upcoming Petscan will show the results of the treatment. 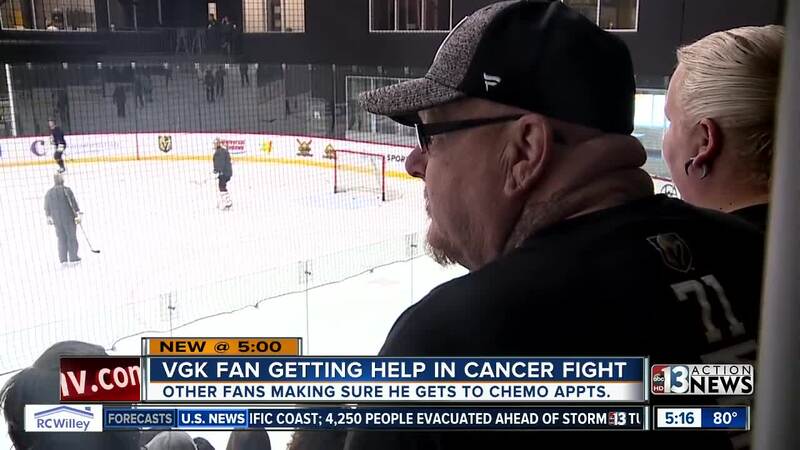 While Mel and Maria pray for good news, Mel said the support he's received from other Golden Knights fans has given him strength to continue to fight. "It gives me hope for mankind because I've never experienced anything like that before where strangers are, you know, feeling for you," he said. "It's been amazing."